An appreciation of the development and evolution of the United Kingdom constitution is vital in order to understand the existing nature of the constitution, proposals for reform and the many complex challenges it faces. Ann Lyon presents a vivid overview of fourteen hundred years of English legal history taking us on a rich journey from a feudal society to the fractured Union of the present day. Drawing on key constitutional themes, Constitutional History of the United Kingdom provides insight and context to modern constitutional problems. This second edition has been revised and updated to bring coverage up to the present day, including parliamentary reform; the Scottish referendum on independence and further drives for enhanced devolution; the effect of EU membership on the UK Constitution; and the impact of the European Convention on Human Rights and the Human Rights Act 1998. Constitutional History of the United Kingdom offers an accessible and highly valuable overview for students with little or no prior knowledge of British history. 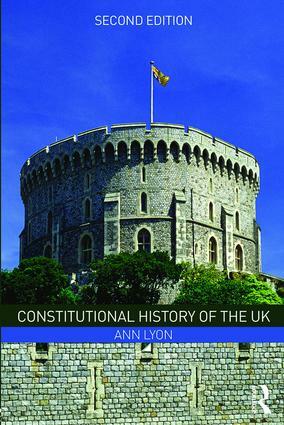 ‘Constitutional History of the United Kingdom tells the story of the evolution of the constitution to the present day. It is a fascinating story, extremely well told by an historian who now teaches law. The book is of relevance to students of law, history and government, a source of reference for undergraduate law students and essential reading for postgraduate study. The author makes the point that students of law often lack a historical perspective, essential to a thorough knowledge of the UK constitution, and this work is to my knowledge, the only recent one to explain the history of the UK with a view to illuminating constitutional changes. Its sheer breadth is impressive. It begins with a description of the development of government pre-1066, followed by a sweep of 14 centuries, culminating in UK membership of the EU and the adoption of European Convention on Human Rights. Themes provide continuity to the sequence of events; so, for instance, coherence is traceable through the events that inexorably led to the balance of power shifting from king to Parliament, and to our modern democracy. It explains well the background to events that were initially often violent and, in more recent history, political, and the conundrum of the UK constitution becomes over clearer as the reader progresses. The Constitutional History of the United Kingdom should be read by all students of constitutional law but is also a work of reference and could be enjoyed by anyone seeking to further their knowledge of UK History’. Times Higher Educational Supplement, 28 May 2004. 'This is a thorough and very readable book, especially useful for references as well as a textbook…Law students should read Lyon' Representation, Michael Rush, University of Exeter. Vol 41, Number 2, 2005. Ann Lyon is a Lecturer in Law at the University of Plymouth, specialising in Constitutional Law and Constitutional History.